The Rollright Stones is one of England's most beautiful ancient sites. Standing on the Oxfordshire/Warwickshire border, it consists of three groups of megaliths - The Kings Men stone circle, the King Stone and the Whispering Knights. 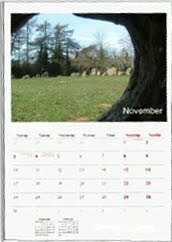 The trust always needs money to help it in its aims, and one of the best ways to help is to buy the Rollright Stones 2011 Calendar, which has just gone on sale. The calendar is ideal to give as a Yule gift, or you could just buy one for yourself. All the money raised goes towards upkeep of the site. You can order the calendars from the The Rollright Trust website using paypal or send a cheque in the post.